Now Christmas is over and the New Year is here, thoughts start to turn to summer holidays, perhaps a little hopefully. Or perhaps you are lucky enough to live in a region which sees permanent mild weather, even in January and are looking for a regular everyday sandal just to wear. 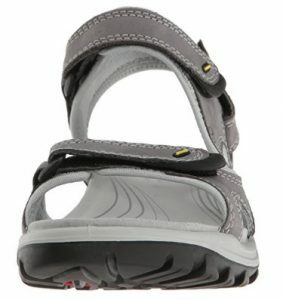 Whichever your requirements, the Ecco Women’s Offroad Lite Sandal will most likely fulfill them. These are a shoe that look like they mean business. 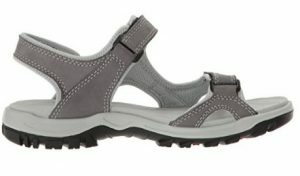 The clue is in the name and these ‘Offroad Lite’ sandals should not disappoint in the walking stakes! 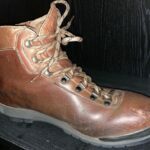 As you might hope, these have been designed for hiking and trekking off road and promise to be a mighty comfortable wearing experience. Judging by the look of these Offroad Lites, we would say it looks like they should deliver what it says on the tin. We definitely would not describe these as being girly or in any way fragile. We would expect to be able to slip these on and start marching over any sort of terrain that we pleased. 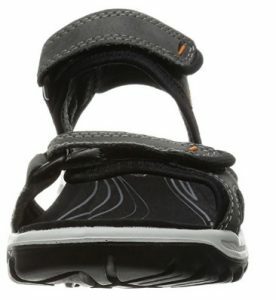 The soles are rugged looking and as if they have been designed with rough walking in mind. They also come with something called Receptor technology. 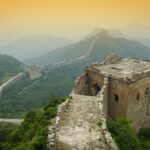 This helps you bounce around on a more even kilter without falling over. Providing first class support and cushioning, these Offroad Lites are balanced and comfortable to have on and the mesh lining helps to protect your foot further. The EVA foot bed is lightweight and molded, and has a nice, soft microfiber cover. 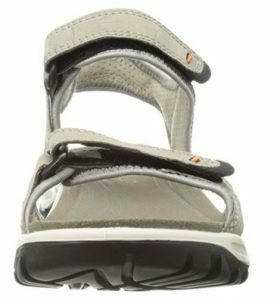 The upper is made of a flexible and soft nubuck leather and all three straps are adjustable. This makes these sandals completely customizable to your exact shape. These are a practical, every day sandal but we would not describe them as being formal attire. The Ecco Women’s Offroad Lites are perfect for strolling, trekking and general all purpose walking in. You might even like to wear them for rambling and perhaps running in. One thing you’re probably not going to choose them for is going into the office in or for a night out at a smart restaurant. These are best for an outdoors environment and lifestyle. 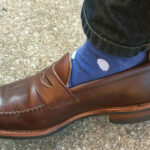 Not that you can’t wear them indoors of course. Available in four colors, none of them screaming “showy”, you can choose between Titanium/Concrete, which is a light gray color, Dark Shadow, which is a darker gray color, Moon Rock, which is a very light shade of gray. The only hint of color comes in the self explanatory Mauve/Black which is, as the name suggests, mauve and black. So, you are highly unlikely to buy these for their exciting colors, but that is alright. The nubuck leather upper features stylish double stitching and easily adjustable hook and loop fastenings. Ecco shoes are a Danish company, who boast that their shoes should never need to be broken in. Looking at these, with their EVA foot bed and PU injected midsole foam, we find that easy to believe. They also shouldn’t let you down in terms of support, either. And with a rubber sole capable of providing superior traction we believe these will be everything that they say they are. Ecco shoes can trace the origins of their shoes, right from the tannery up to the shop floor. They are proud of still owning the factories their shoes are produced in and they exercise a large degree of control over their manufacturing process. This pays off in terms of quality materials and workmanship, the sort of things you have come to expect from a company like Ecco. In terms of caring for these Eccos the manufacturer does not recommend putting them in the washing machine. Instead, Ecco sell their own range of cleansers and maintenance products to use on their shoes. With three adjustable straps, we think that these are a pretty good fit. Although they are not available in a half size or a special narrow or wider fit, when you can adjust the straps you shouldn’t really miss that too much. 84% of customers think that these fit as expected and we reckon you should be able to buy your usual size without any problems. 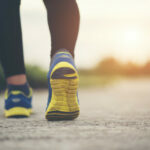 One or two people think that they aren’t the best for narrower feet, but most people think you can tighten them up just fine. One thing we can all definitely agree on is that these are a very comfortable pair of sandals. They appear to have it all, an EVA featherlight foot bed, PU injected sole, nice soft nubuck leather upper and easily adjustable straps. If your feet need extra support, we think these should provide a reasonable degree of it and they don’t need any breaking in, to boot. 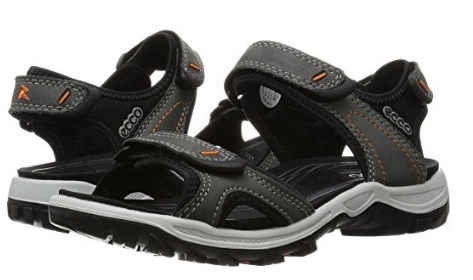 These are an all terrain sandal which can go pretty much anywhere you want them to. The one thing they are not really is waterproof, so we would advise caution there. Should these get wet, the advice is to let them air out gently. Don’t go putting them on the radiator or even worse, in the dryer! It may take them a little while to dry out, but they do dry up eventually. Either way, they aren’t designed for anything that is going to completely soak them – a bit of light rain should be fine though. 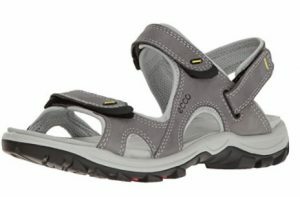 We like these Ecco Women’s Offroad Lite Sandals. 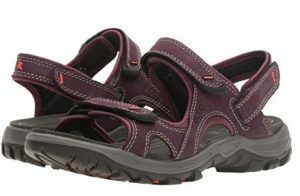 They are practical and comfortable and we can wear them over rugged terrain. This makes a change from feeble and girly sandals that break on us at the first sign of a challenge and aren’t very comfortable to have on! For a practical and versatile sandal to take to the beach or clamber over rocks in, we say go for it!